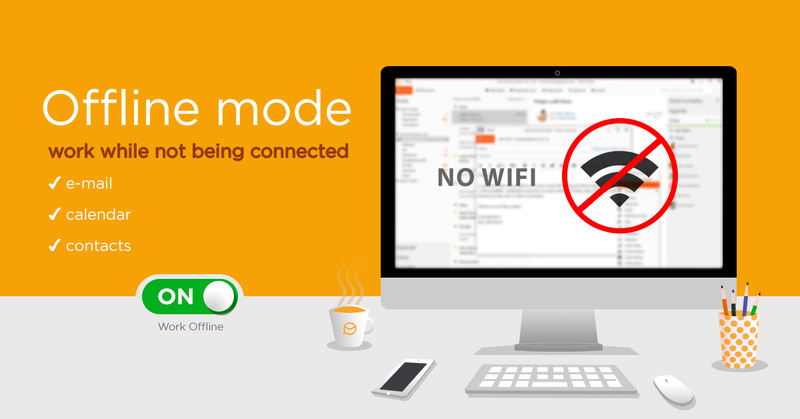 eM Client Offline Mode is perfect for conserving bandwidth, solving issues and much more! This feature is extremely useful when you’re on a network with data limits and you want to conserve bandwidth. Simply finish your work, turn off Offline Mode and send all your mails at once, saving significant amount of data. You can use Offline Mode for those Sunday evenings when you just want to finish up work from the previous week without having to look at the flood of e-mails that’s awaiting you on Monday, to name just one of its many uses. Offline Mode is also very useful for troubleshooting – if you, for example, attempted to send a very large e-mail and that blocked your syncing since your server does not allow it, simply launch eM Client in Offline Mode and delete the troublemaking e-mail. The standard way to enable Offline Mode is to go to Menu – File and click on “Work Offline”. However if you need to troubleshoot or if you just want to completely avoid any syncing, you can launch eM Client in Offline Mode by holding Ctrl when clicking on the eM Client icon. Simply keep holding Ctrl and click “Yes” when asked if you want to launch in Offline Mode.